France (French: France), officially the French Republic (French: République française), is a country in Western Europe. Its capital city is Paris. It is a member of the European Union. It is known for its culture, its many monuments and structures, and places such as the Louvre, the Eiffel Tower, the Arc de Triomphe, Giverny, Mont Saint Michel, Versailles, and Notre Dame de Paris. France is divided into 22 régions that are further subdivided départements. The country has been one of the great powers since the end of the 17th century. In the 18th and 19th centuries, it built a big colonial empire across West Africa and Southeast Asia. Nowadays, this does not exist. It is the most visited country in the world. About 82 million foreign tourists visit it every year. France is a founding member of the European Union. It has the largest land area of any member. France is also a founding member of the United Nations, and a member of the G8 and NATO. It is one of the five permanent members of the United Nations Security Council. It has nuclear weapons, including active warheads, and also has nuclear power plants. Some well-known cities in France include Nice, Nancy, Marseille, Bordeaux, Lille, Lyon, Toulouse, Limoges, Strasbourg, Rennes, Nantes and Paris. France is in Western Europe. 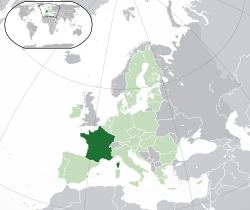 France has borders with Belgium, Luxembourg, Germany, Switzerland, Italy, Monaco, Andorra, and Spain. France has two mountain ranges near its borders: the Alps in the east and the Pyrenees in the south. There are many rivers in France, including the Seine and the Loire. In the north and the west of France, there are low hills and river valleys. France has the second-largest Exclusive Economic Zone (EEZ) in the world. It covers 11,035,000 km2 (4,260,637 sq mi). Only the United States has a larger one. The name "France" comes from the Latin word Francia, which literally means "land of the Franks" or "Frankland". The Carolingian dynasty ruled France until 987, when Hugh Capet became King of France. His descendants, the Direct Capetians, the House of Valois and the House of Bourbon, unified the country with many wars and dynastic inheritance. The monarchy was the most powerful during the 17th century and the reign of Louis XIV of France. At that time, France had the largest population in Europe. The country had a big influence over European politics, economy, and culture. French became the common language of diplomacy in international affairs. Much of the Enlightenment happened in France. French scientists made big scientific discoveries in the 18th century. France also conquered many overseas possessions in the Americas, Africa and Asia. France had a monarchy until the French Revolution in 1789. King Louis XVI and his wife, Marie Antoinette, were executed in 1793. Thousands of other French citizens were also killed. Napoleon Bonaparte took control of the Republic in 1799. He later made himself Emperor of the First Empire (1804–1814). His armies conquered most of continental Europe. The metric system was invented by French scientists during the French revolution. The country was where both the First and Second World Wars took place. During the First World War, millions were killed in the trenches including over a million in the Battle of the Somme. The conditions were very poor. The last surviving veteran was Pierre Picault who died on 20 November 2008 at the age of 109. During the Second World War, Nazis occupied France. The Allies landed in Normandy on June 6, 1944 and began the Battle of Normandy. German forces lost France in just a few months. Corsica has a different status than the other 21 metropolitan regions. It is called collectivité territoriale. Réunion (in the Indian Ocean). Then France is divided into 100 departments. The departments are divided into 342 arrondissements. The arrondissements are re-divided into 4,032 cantons. The smallest subdivision is the commune. On January 1, 2008, INSEE counted 36,781 communes in France. 36,569 of them are in metropolitan France and 212 of them are in overseas France. France has about 359,000 military personnel. France spends 2.6% of its gross domestic product (GDP) on defence. This is the highest in the European Union. France and the UK spend 40% of the EU defence budget. 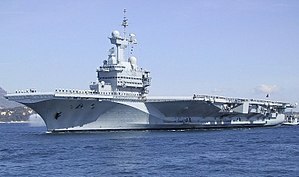 About 10% of France's defence budget is for its nuclear weapons force. The first completed Airbus A380 at the "A380 Reveal" event in Toulouse on 18 January 2005. Airbus is a symbol of the globalisation of the French and European economy. France is the leading agricultural producer and exporter in Europe. France exports wheat, poultry, dairy products, beef, and pork. It is also famous for its wine industry. France received 10 billion euros in 2006 from the European Community as to its farmers. On 1 January 2008, it was estimated that 63.8 million people people live in France, including in the Overseas Regions of France. 61,875,000 of these live in metropolitan France, the part of the country that is within Europe. About 85% of the people living in France are Roman Catholic, 10% are Muslim. During the 17th century, Pierre Corneille, Jean Racine, Molière Blaise Pascal and René Descartes were the main authors. Many famous French novels were written in the 19th century by author such as Victor Hugo, Alexandre Dumas and Jules Verne. They wrote popular novels like The Three Musketeers, The Count of Monte-Cristo, Twenty Thousand Leagues Under the Sea, or The Hunchback of Notre-Dame. Other 19th century fiction writers include Emile Zola, Guy de Maupassant, Théophile Gautier and Stendhal. The Tour de France cycling race in July is one of the best-known sporting events. It is a three-week race of around 3,500 km that covers most of France and ends in the centre of Paris, on the Avenue des Champs-Elysées. Football is another popular sport in France. The French team won the FIFA World Cup in 1998 and the UEFA European Football Championship in 1984 and 2000. France also hosts the 24 Hours of Le Mans car race. France also hosted the Rugby World Cup in 2007 and finished fourth. France is closely associated with the Modern Olympic Games. At the end of the 19th century, the Baron Pierre de Coubertin suggested having the Olympic Games again. France hosted the Summer Olympics twice, in 1900 and 1924, in Paris. France also hosted the Winter Games three times: in 1924 in Chamonix, in 1968 in Grenoble, and in 1992 in Albertville. ↑ (French) INSEE, Government of France. "Population totale par sexe et âge au 1er janvier 2011, France métropolitaine". http://www.insee.fr/fr/themes/tableau.asp?reg_id=0&ref_id=NATnon02145. Retrieved January 2012. ↑ (French) INSEE, Government of France. "Bilan démographique 2010". http://www.insee.fr/fr/themes/document.asp?ref_id=ip1332. Retrieved 20 January 2011. ↑ 3.0 3.1 3.2 3.3 "France". International Monetary Fund. http://www.imf.org/external/pubs/ft/weo/2013/01/weodata/weorept.aspx?pr.x=49&pr.y=17&sy=2012&ey=2012&scsm=1&ssd=1&sort=country&ds=.&br=1&c=132&s=NGDP%2CNGDPD%2CNGDPPC%2CNGDPDPC%2CPPPGDP%2CPPPPC&grp=0&a=. Retrieved 17 April 2013. ↑ "CIA World Factbook". CIA. https://www.cia.gov/library/publications/the-world-factbook/fields/2172.html. Retrieved 16 April 2013. ↑ "Regions of France" (htm). French Property, Services and Information Ltd. 2008. http://www.france-property-and-information.com/France-regions.htm. Retrieved 2010-08-03. ↑ 8.0 8.1 "NATO - Member countries". Nato.int. 2010-07-30. http://www.nato.int/cps/en/natolive/nato_countries.htm. Retrieved 2010-08-03. ↑ "Western Europe". http://www.essex.ac.uk/armedcon/world/europe/western_europe/default.html. Retrieved 2 August 2010. ↑ 10.0 10.1 "French Geography". http://www.kwintessential.co.uk/articles/article/France/Geography-of-France/540. Retrieved 2 August 2010. ↑ "French Rivers". http://www.francethisway.com/tourism/french-rivers.php. Retrieved 2 August 2010. ↑ World Travel Guide. "Climates of France". http://www.worldtravelguide.net/country/92/climate/Europe/France.html. Retrieved 2 August 2010. ↑ "Practical Information on France – General". French Tourist Office. http://www.francetourism.com/practicalinfo/general.htm. Retrieved 2009-09-30. ↑ The Sun Chronicle. "Origin of Francia". http://www.thesunchronicle.com/articles/2008/04/20/features/3057797.txt. Retrieved 3 August 2010. ↑ Discover France. "Caesar Conquered Gaul". discoverfrance.net. http://www.discoverfrance.net/France/History/Roman_Empire.shtml. Retrieved 3 August 2010. ↑ wff. "France used this pretext to call themselves this". http://www.wf-f.org/03-1-France.html. Retrieved 3 August 2010. ↑ UNCG. "French History - Le Grand Siècle". http://www.uncg.edu/rom/courses/dafein/civ/timeline.htm. Retrieved 3 August 2010. ↑ Understand France. "French colonies History". http://www.understandfrance.org/France/History3.html. Retrieved 3 August 2010. ↑ Lucidcafé. "Louis XVI and Marie-Antoinette's executions". http://www.lucidcafe.com/library/95nov/antoinette.html. Retrieved 3 August 2010. ↑ Napoleonguide.com. "Campaigns of Napoleon Bonaparte". http://www.napoleonguide.com/campind.htm. Retrieved 3 August 2010. ↑ alsintl.com. "French language in Colonies". http://www.alsintl.com/resources/languages/French/. Retrieved 3 August 2010. ↑ firstworldwar.com. "Battle of the Somme". http://www.firstworldwar.com/battles/somme.htm. Retrieved 3 August 2010. ↑ (French) INSEE, Government of France. "Code officiel géographique – Présentation". http://www.insee.fr/fr/methodes/nomenclatures/cog/documentation.asp. Retrieved 2008-06-27. ↑ (French) INSEE, Government of France. "Code des collectivités d'outre-mer (COM)". http://www.insee.fr/fr/methodes/default.asp?page=nomenclatures/cog/outremer.htm. Retrieved 2008-06-27. ↑ "France's political system". http://www.absoluteastronomy.com/topics/Semi-presidential_system. ↑ Guy Carcassonne. "Separation of Powers". unc.edu. http://www.unc.edu/depts/europe/francophone/principles_en.pdf. Retrieved 4 August 2010. ↑ "Number of military personnel in France, page 32". http://www.csis.org/media/csis/pubs/060626_asia_balance_powers.pdf. ↑ "Number of military personnel in France, page 112". http://www.csis.org/media/csis/pubs/westmb012302%5B1%5D.pdf. ↑ "Members of the UN". United Nations. http://www.un.org/en/members/index.shtml#f. Retrieved 4 August 2010. ↑ "Members of the Security council". United Nations. http://www.un.org/sc/members.asp. Retrieved 4 August 2010. ↑ "History of the EU". European Union. http://europa.eu/abc/history/index_en.htm. Retrieved 5 August 2010. ↑ "Opposition of the war in Iraq". BBC website. http://news.bbc.co.uk/2/hi/middle_east/2688117.stm. Retrieved 5 August 2010. ↑ "CIA World Factbook GDP PPP data update of 2008". US Government. 20 November 2008. https://www.cia.gov/library/publications/the-world-factbook/rankorder/2001rank.html. ↑ "Euro launched in 12 countries". http://news.bbc.co.uk/2/hi/business/1845045.stm. ↑ "Number of companies in France". http://www.journaldunet.com/management/repere/entreprises_france_type.shtml. ↑ "Shareholding policy". Électricité de France. 31 December 2007. http://investisseurs.edf.com/the-edf-group/edf-investors/stock-information/shareholding-policy-117065.html. Retrieved 2009-04-05. ↑ (French) CNES. "France" (PDF). http://www.ademe.fr/midi-pyrenees/documents/a_3/cnes_dossier_presse.pdf. Retrieved 2007-05-30. ↑ "Rocket launch site in Kourou". http://www.russianspaceweb.com/kourou_origin.html. ↑ "France, smallest producer of CO2". http://www.bls-frenchcourses.com/french-economy-industry-GB.html. ↑ DGEMP / Observatoire de l'énergie (April 2007). "Électricité en France: les principaux résultats en 2006.". http://www.industrie.gouv.fr/energie/statisti/se_elec.htm. Retrieved 2007-05-23. ↑ "France is the leading agricultural producer and exporter in Europe". http://www.ameinfo.com/185827.html. ↑ "Q&A: Common Agricultural Policy". BBC News. 20 November 2008. http://news.bbc.co.uk/2/hi/europe/4407792.stm. ↑ "1833 Factory Act" (htm). The National Archives. http://www.nationalarchives.gov.uk/education/lesson13.htm. Retrieved 2010-03-14. ↑ 48.0 48.1 "Demographic report 2007 - The birth rate remains very high". Government of France - INSEE. http://www.insee.fr/en/themes/document.asp?ref_id=ip1170&reg_id=0. Retrieved 2008-01-15. ↑ 49.0 49.1 49.2 49.3 49.4 49.5 49.6 49.7 "Background Note: France". Under Secretary for Public Diplomacy and Public Affairs > Bureau of Public Affairs > Bureau of Public Affairs: Electronic Information and Publications Office > Background Notes - Bureau of European and Eurasian Affairs. U.S. State Department. August 2008. http://www.state.gov/r/pa/ei/bgn/3842.htm. Retrieved 2008-10-24. ↑ "France an important language of diplomacy". Archived from the original on 2008-04-23. http://web.archive.org/web/20080423103843/http://www.history.com/encyclopedia.do?articleId=207636. ↑ Catholic World News (2003). "France is no longer Catholic, survey shows". http://www.catholicculture.org/news/features/index.cfm?recnum=48547. Retrieved 2007-01-11. ↑ "Eurobarometer on Social Values, Science and technology 2005 - page 11" (pdf). http://ec.europa.eu/public_opinion/archives/ebs/ebs_225_report_en.pdf. Retrieved 2007-05-05. ↑ "French literature started in the Middle Ages". http://www.discoverfrance.net/France/Literature/DF_literature.shtml. ↑ 17eme siecle. "French authors of the 17th century". http://17emesiecle.free.fr/Auteurs.php. Retrieved 2 August 2010. ↑ "Perrault's tales". PerraultFairyTales.com. http://www.perraultfairytales.com/en/stories. Retrieved 2010-09-12. ↑ Boorsch, Jean (1996). "French Literature" (html). Discoverfrance.net. p. 5. http://www.discoverfrance.net/France/Literature/DF_literature.shtml. Retrieved 2010-08-03. ↑ Damian Papworth. "Famous tour de France". http://www.weightlossdietinformation.com/the-tour-de-france-the-most-famous-bicycle-race-in-the-world.html. Retrieved 2010-09-16. ↑ Dautaj, Jacqueline; Delp, Valorie; Finley, Amy. "Popular French Sports". LoveToKnow Corp.. http://french.lovetoknow.com/Popular_French_Sports. Retrieved 2010-08-03. ↑ "French Cheeses". http://www.goodcooking.com/frcheese.htm. Retrieved 1 August 2010. ↑ "French Cheese". http://www.franceway.com/cheese/. Retrieved 1 August 2010. ↑ "The world's best cuisines". http://trifter.com/practical-travel/world-cuisine/top-10-most-tasty-cuisines-in-the-world/. Retrieved 1 August 2010. ↑ "Butter and oil in French Cuisine". http://www.google.com/hostednews/afp/article/ALeqM5jvmxWfyZ2tFVA3qcmC7DkX6SMi5g. Retrieved 1 August 2010. ↑ 2.0 2.1 Including all the overseas departments but excluding overseas territories and the French territory of Terre Adélie in Antarctica where sovereignty is suspended since the signing of the Antarctic Treaty in 1959. ↑ Metropolitan France only. The population density for the whole territory of the French Republic (including overseas departments and territories) is 96.837/km2 (250.81/sq mi). About-France.com. "Clear but detailed information about France". http://about-france.com. Central Intelligence Agency. "CIA World Factbook – France". https://www.cia.gov/library/publications/the-world-factbook/geos/fr.html. Lescommunes.com. "Cities and Towns in France". http://www.lescommunes.com/index.en.html. Retrieved 2010-08-08. This page was last changed on 21 December 2014, at 23:28.